Population is a statistic everyone knows about a town. It’s an important stat, as it tells us how many residents there are, roughly how many taxpayers there are, how many voters, etc. However, especially for large cities, it’s extremely important to know how many people are in the city during the day. Commuters swell San Francisco’s daytime population to over 950,000, a fifth more than actually live there. Breakdown of daytime population by county. Population on the left is what’s lost to out-commuting. Population on the right is daytime population. For smaller cities and towns, the daytime population numbers tell us how mobile people are and how much of a destination a place is. If there are a lot of workers coming in, it’s an employment center. If there are a lot going out, it’s a bedroom community. And if there are both a lot coming in and a lot going out, there is a mismatch between a city’s jobs and its people. The US Census Bureau ran the numbers on cities and places with a population of 2,500 or more, and the Atlantic Cities covered what the data means for big cities and regions. I’m curious about what it means for Marin. Marin’s cities by daytime population. Marin has been undergoing a transformation for the last 30 years, moving away from being a bedroom community for San Francisco and more toward being a jobs destination in its own right. Though the shift has been slow, Marin now has more jobs than workers, owing in part to a decline in the workforce and in part to an increase in jobs. The number of people commuting in has grown 3 percent; the number of people commuting out has shrunk 12 percent; and daily change in population has swung from -1.6 percent to +1.2 percent. 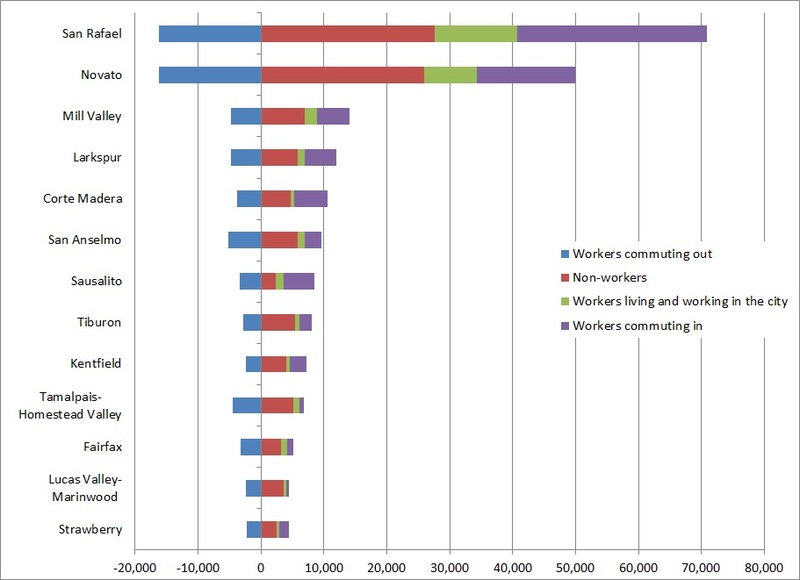 Data from other sources says most of Marin’s 45,000 in-commuting workers live in Sonoma and Contra Costa, but we get some from San Francisco and Alameda as well. All told, these folks hold 37 percent of Marin’s jobs. There is a sense, however, that Marin is a collection of bedroom communities. While this isn’t true in aggregate, every town and place in Marin sends a large portion of their workforce off to work elsewhere. Just worker numbers. Blue are local workers; red are in-commuters. 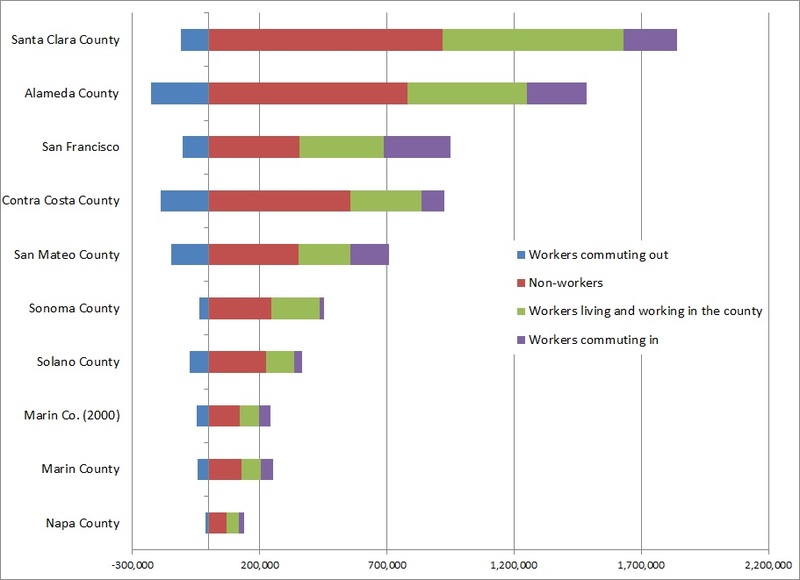 As before, population on the right is in-city, while population on the left is out-commuting. Most interesting in this regard are towns like Corte Madera, which actually grow during the day but whose local workforce overwhelming leaves the city during the day. While the place itself is a destination, the voting constituency sees its town as principally an origin rather than a destination. When asked to choose which transportation investments to make, they will probably choose the ones that will facilitate their own commute out of town rather than the investments that will facilitate the commute to their town. Also emerging from this data is San Rafael’s place as Marin’s downtown. Its population grows by almost a quarter, more than San Francisco, from 57,000 to over 70,000. Novato, with a similar number of residents, doesn’t change at all during the day, sending out as many workers as it takes in. 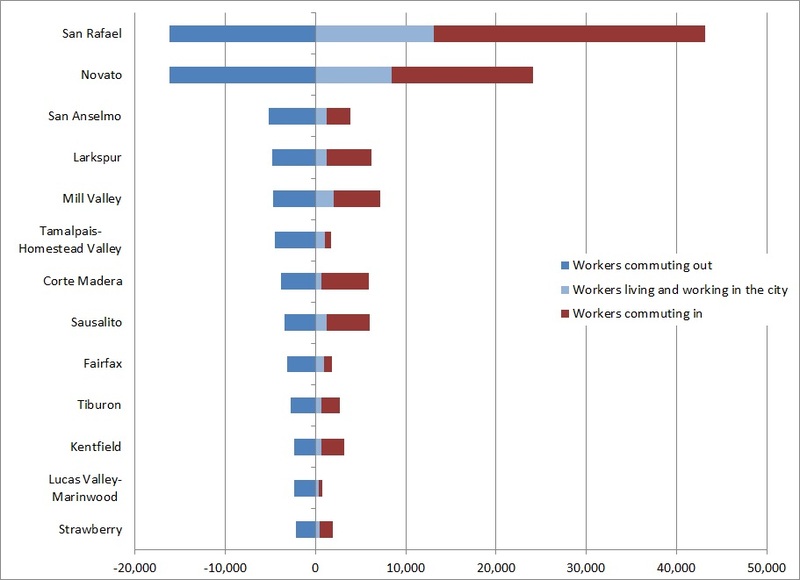 These data imply that most Marin commutes are between towns rather than between counties, as every town in Marin has more of their workforce leaving than staying while the county has a whole has more of its workforce staying than leaving. This has implications for Marin’s transportation and housing planners. First, it means transportation infrastructure investments should principally focus on short-hop transportation: bike lanes, better intra-county transit, and walk-appeal improvements. Each of these will encourage short-haul commuters to bike, take transit, walk, or any mix of those. This would leave roads and parking lots open for those who really need or want to drive. Second, it means transportation officials should examine how to facilitate long-haul transit commutes. Morning transit from San Francisco to Marin is pitifully bad. Hour-long bus headways make sure someone is always either late or early, while Larkspur Ferry drops commuters off in the middle of a parking lot with minimal transit service. From Contra Costa, 28-minute headways are better but the travel time is longer than it needs to be. Midday headways get as high as 60 minutes. And third, it means the linkage between housing and jobs growth is best done on a county-wide, rather than city-wide, basis. Municipal boundaries are arbitrary, and it’s clear Marinites ignore them when it comes to jobs and homes. A Marin County subregion for RHNA allocations would make far more sense than the city-by-city allocations ABAG is now forced to make. This new dataset from the Census will be extremely useful to the big cities, but it can also open a window into the behavior of our little corner of the country. Marin is maturing into a proper inner-ring suburb, drawing commuters all its own. Planners and residents need to shift their thinking, and their projects, to match that reality. UPDATE: If you want to examine the data yourself, you can find full tables on the Census website. I’ve also isolated the Bay Area county data and the Marin town, city, and place data into a single spreadsheet. There have been some significant shifts since 2000 at the place level, but considering margins of error on the 2010 data I hesitate to read too much into them for the smaller places. Discussions of Marin’s development often lack data but are long on anecdote and impressions, giving misguided assertions about Marin’s population or housing undue cachet. But if Marin wants to genuinely plan for the future, it must face the facts of its people and its housing market: there is strong demand for larger apartments in Southern Marin and smaller apartments elsewhere; there are more kids and more people living alone; and that the graying population will need to be able to downsize. Between the 2000 and the 2010 Census, Marin’s population grew by about 2 percent and its median age increased three years, from 41.3 years old to 44.5. While the proportion of school-aged children increased by about 1 point, the proportion of middle-aged people plummeted by 10 points; those aged 55 and up increased by a similar amount. So, while we got older, our families grew a bit. 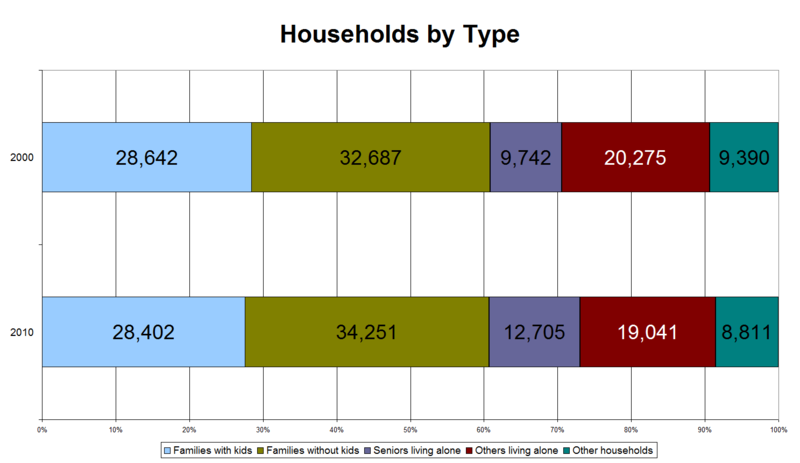 And though our average household got a bit larger, the number of people living alone, especially seniors has already started to increase faster than the population as a whole, while the proportion of families has actually gone down. The shift is divergent between Southern Marin and the rest of the county. While the median age of Southern Marin has kept pace with the rest of the county, it’s been attracting families. The number of people living alone actually declined by 2.5 percent in Southern Marin while it jumped 9.4 percent everywhere else. The population of elementary-aged kids positively boomed, growing an astounding 17.3 percent while the rest of the county’s population shrank by 1.1 percent. Yet even here, the continued shift to older individuals means its familial boom can’t continue without seniors leaving the region. Southern Marin is where the families are going, it’s true, but it’s aging just as quickly. Unless those seniors start to leave or new family housing is built in Southern Marin, housing costs are going to continue to climb into the stratosphere. As this shift away from families and towards empty-nesters goes on, people will increasingly use family-sized homes for couples and singles. Already we have 1.17 bedrooms per person compared to 0.95 for the state and 1.15 for the country at large. If we want to keep our homes turning over while keeping our long-term residents in town, we need to allow space for people to downsize into. Senior housing, small single-family homes and the like would allow people to transition without leaving out of the county. Building such homes near transit would give seniors flexibility once it’s no longer feasible to drive, incidentally a goal of AARP. Rents reflect the shifting demands in Marin’s largely stagnant market. The average rent for a three bedroom apartment has skyrocketed in Southern Marin, moving up 28 percent to $3,232 in just a year, from the first quarter of 2011 and now. Studio rents there have stayed fairly steady, increasing only 4 percent in the same time period. In Central Marin, however, studios and two-bedroom apartments have dominated the market’s rise, with average rent increasing by 14 percent and 17 percent, respectively. The housing supply has left behind the studio apartment. Marin has been upsizing, replacing small homes for large ones: the number of no- or one-bedroom homes has dropped 19 percent while larger homes have increased 11.9 percent. It means there will quickly be a shortage of studio and one-bedroom apartments, and there’s no relief on its way. Zoning codes currently in force actually punish developers for building small units. Density limits on a per-unit basis encourage developers to build the largest units that can be rented rather than the most rentable mix of units. Other limits, such as maximum floor area or parking minimums, further strains a developer’s capability to build small. ABAG density guidelines only make the problem worse by politicizing density over height, inspiring impassioned speeches against zoning 31 units per acre. In Southern Marin, where high rents should bring more development, community backlash against any and all development has had a major chilling effect. Who would buy developable land when they see the nightmare faced by the Blithedale Terrace? Those high rents for three bedroom apartments are the result of a major housing shortage. Shockingly, they’re actually approaching the cost of studio apartments on a square-foot basis, something unheard of except in extremely constrained and warped markets. If Marin wants to continue to be a place for families and its seniors, it must move away from density limits and allow the market to adjust. San Rafael is already doing this with the Downtown Station Area Plan, which maintains height limits but abolishes density limits. Southern Marin could get a boost from the Mill Valley General Plan update if it’s paired with permitting process reform. Marin can’t be held in stasis; its housing supply is built for an increasingly small demographic – the home-owning family – leaving the childless, seniors, and renting families to compete with extraordinarily high prices. If Marin tries to steer clear of infill development it will only shut out all but the wealthiest of new residents and those lucky enough to get a spot in affordable housing. We’ll be forced to build nonprofit housing, burdening municipal and county budgets with people who need services but whose homes are exempt from property and parcel taxes. Marin is changing, and our governments and residents need to let our housing supply do the same.